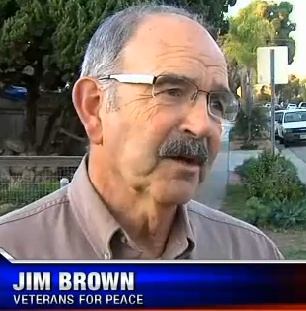 San Diego Veterans For Peace member Jim Brown recently appeared on San Diego’s KUSI News for a story about the 13-year long Afghanistan War coming to an end. Click here to watch the news clip on KUSI’s website. I was so impressed with Jim Brown’s comments on KUSI. I want to be a contributing part of SDVFP because of my agreement with Mr. Brown.